Uncompromising state-of-the-art technical superiority, reliability, precision, customer support, with no cutting of Original Equipment Manufacturers wires or harnesses, and safe yacht control on 15,000 boats over 15+ years! Yacht Controller uses key pad levers created for us by Porsche design making them ergonomic, distinctive and intuitive for the user to identify the command control by touch without having to look down at the remote. This design greatly increases safety and intuitive reaction to all situations as you don’t have to divert attention from the boat and surroundings when docking. Our receiver box is IP 65 rated ( protected against even jets of water), and manufactured of highest quality and safety against humidity and water intrusion. Our housings have been proven and standardized in the industry now for almost 20 years and our harnesses and cable end connectors are the highest quality waterproof and certified for marine use to avoid corrosion which is a leading cause of electrical failure and short operating life. Yacht Controller has a specified and dedicated take command/engage button to ensure proper and safe transfer of power which makes it compliant with regulations and avoids the possibility of dangerous accidental take command. Yacht Controller meets (or exceeds) the safety standards of the electronic yacht control manufacturers.Yacht Controller has many compliance certifications performed by independent outside certified testing laboratories and further verified by electronics control manufacturers. An array of these certifications is available for inspection on the Yacht Controller website or by contacting us. We believe independent laboratory certification is an important evaluation tool for consumers rather than self-certification where safety of operation is paramount. LED’s on the Yacht Controller receiver confirm proper functioning of its individual processors, and our software uses continuous diagnostics checking which will set off sequential audible alarms indicating a type of failure should it occur. For example, low voltage to the system would set-off its unique audible alarm. This provides an easy and secure method of testing the system especially during installation and a safeguard of the system thereafter. 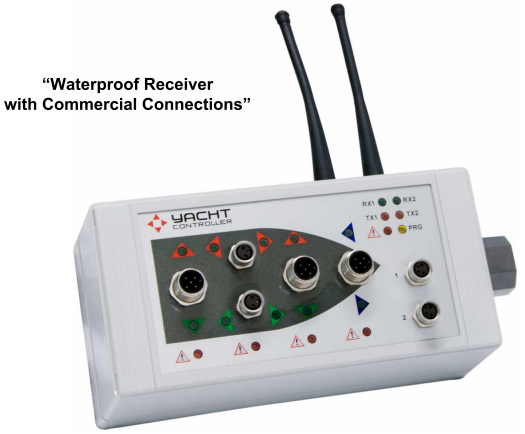 Yacht Controller connects to your engines and to many types of thrusters via our proprietary plug and play interfaces which work in conjunction with your existing electronic control systems on board, and recognize Yacht Controller as another valid control station. We do not CUT or by-pass these important electronic controls and computers which are designed to keep your propulsion system safe and functional. We also do not cut wires or bridge wires to directly connect to engine solenoids which could cause failure of transmissions, controls, thrusters or other components. As such, our system has never caused a failure of an electronics manufacture or thruster manufacturers equipment allowing us to forge partnerships with companies such as Aventics, MAN, MTU, Glendinning and others. *Not avaliable on Yacht Controller Sport.